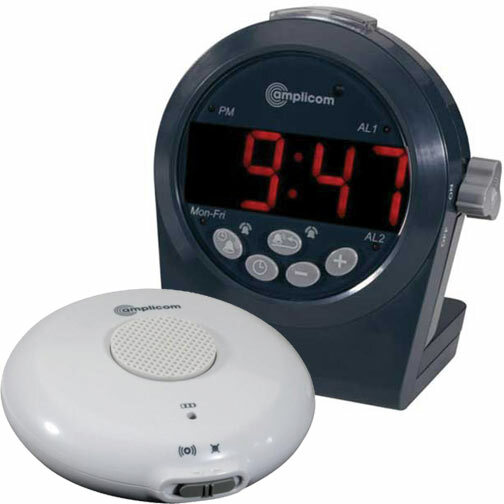 This alarm clock from Amplicom provides sleepers with freedom from wires with the first amplified alarm clock to come with a wireless bed shaker. The shaker slips easily into a pillow case and has up to 80 hours of standby time. 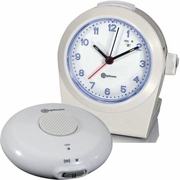 In addition to normal alarm clock time settings, the alarm clock has a built-in telephone signaler so you can be notified of incoming phone calls as well. Wake to a loud 90dB audio alarm, vibration, or both. Two year warranty.